The unnamed union official is a union official working for the Messina Family in The Ballad of Gay Tony in 2008. The character appears solely during "Practice Swing", when Rocco Pelosi attempts to extract information out of him by having him strapped to a Caddy, and attempting to hit him with golf balls on the driving range. When Gay Tony and Luis Lopez arrive on Rocco's orders, he gives Luis the driver club to pelt the union official, while Rocco goes down and talks to him. After being hit a few times, the Union Official gives Rocco some information, but they are interrupted by an attack by the Messinas. Rocco, Luis, and Gay Tony kill some of the attackers, and flee in the golf carts. Depending on whether the Union official lives or not, Rocco will either leave the body, or take the Union official away to torture for more information; his fate after that is unknown. 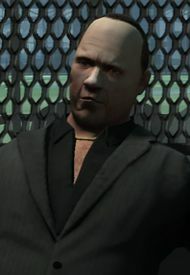 The union official finally reveals that the head of the LTA is working with the Messina Family, leading to his assassination in his private jet in a later mission, "Bang Bang". This page was last modified on 27 October 2013, at 16:28.